THIS WEEKS WARS ARE A JOKE!!!! After finally amending the guild war gas fairly I've gone into these wars with an abundance of gas really looking forward to seeing if I could beat my PB and it keeps not registering completed levels and not then unlocking next stages once you should av after beating right amount of bosses!! Just stuck there!! Did the same mission 4 times still didn't knock it off the list!! My guild is KillSquad18 and so far this is our second war of the day and the second time we've been screwed over by this issue!! Restarting doesn't help today. This is worse than the first GW for bugs and performance. Wasted gas taking out enemies and got nothing for it,, looks like the update is a bit of a mess. Give you more gas but then make it so you have to use loads of gold for healing. I cleared an enemy three times but it wouldn't show the map as complete. > I cleared an enemy three times but it wouldn't show the map as complete. Same here @Scowley along with many in our guild. Found enemy 4 times but it didn’t register until I logged out and back in. It registered my gas being used each time though. Same here. Cleared a few areas and an enemy -- none reflected as done. Looks like we have all been experiencing the same problems then! Played 5 wars this weekend 2 yesterday..both a waste of time/gas and gold!! Then played 2 in the early afternoon today and it actually worked great there and we Won 1 and lost 1 then played 1 tonight and again waste of time same problems happening not clearing levels again just a big waste of time!! Our guild killsquad18 had a record in the 1st month of wars that read 14 WINS 2 LOSES. this time around in the 1st week of wars it reads 1 WIN and 4 LOSES!! its ridiculous and ruining the whole war experience for the weekend. Our real tally this week should be WON 1 LOST 1 and 3 voided!!!! They should wipe the records clean but main thing they need to do is fix the issues and atleast credit us back the war gas and some gold back! Let me ask this. 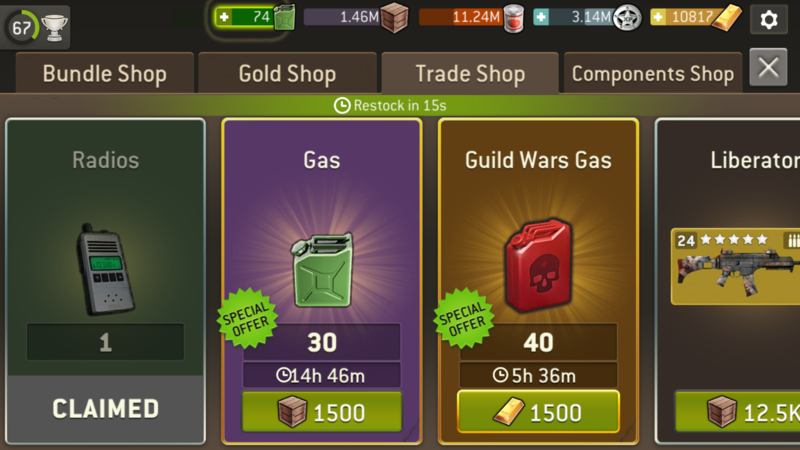 Did anyone have the situation where you could purchase guild gas with TG's and then it wiped out your gold as well? That happened to me! Went from $1900 gold to $300, one push of the button. I never even got the option to purchase GW gas for trade goods. When did you see that? I never saw that one for trade goods. I just got the one for gold only. We at Amazons experienced much of the same problems already posted. Plus some of us didn’t get credit for all our points. It quit adding about halfway thru. 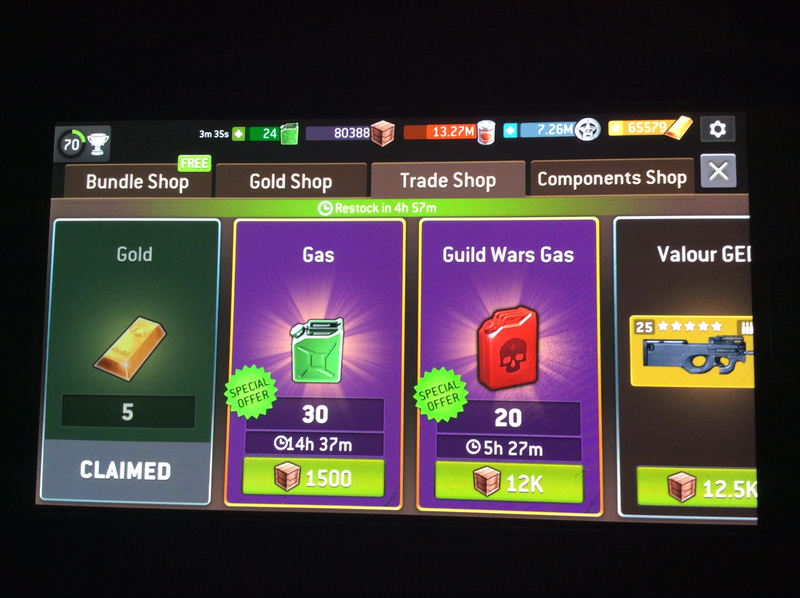 Lots of us spent a lot of gold and gas getting absolutely no where! Dats the one! Lol thanks @SPC_TORRES ! I had 2 offers at once the tg and the gold ( I don’t have a ss of it) couldn’t remember how many tg it was but 12k is exactly right! Yeah, that's the one! The 1500! Had plenty of TG's to cover it!! It's one thing to ripoff my TG's another my gold, that's REAL MONEY!!! I had that happen alot about scoring points in the wars and your score not going up and completing the same boss level 4 times and it still not clearing and also goin to go on levels and it showing a player already on it so wen I looked who it was it was showing ME?? on the level Still??? stupid!